How the Overall Functional Beneficence of various planets calculated? How the astrological beneficence of various planets calculated? How the "Overall Functional Beneficence" of various planets calculated? Which houses are owned by concerned planet? Lordship beneficence/ maleficence values acquired by it due to being lord of certain houses. In which house (considered good or bad) the concerned planet is posited? Also check the Ashtakvarga strength of that posited house? With which planets - the concerned is posited? Also check that those co-posited planets are owners of which houses and they themselves are posited and aspected by which planets? Which planets are aspecting the concerned planet? Also check that those aspecting planets are owners of which houses and they themselves are posited and aspected by which planets? The above written are only some of the most commonly used principles. Besides them, a learned astrologer should also apply special principles to arrive at more accurate "beneficience values", as far as possible. At times, these special Jyotish principles may over-shadow the net result obtained through the normally used Parashari principles to determine the beneficence of a planet. In such cases, these special principles prevail and may reduce (or enhance) beneficence of a planet considerably. 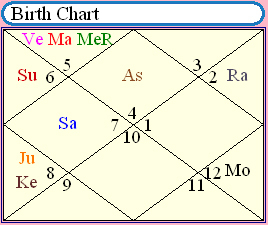 In the above shown sample natal chart, the maximum OFB value is 272.96, got by KETU. On the other side, the minimum OFB value is -70.77, got by SUN. Therefore, the Ketu stands out as the best functional benefic planet for the native while Sun has been determined as the most damaging (functional malefic) planet in his chart.